Sales of RVs and boats fell off a cliff during the recession, causing investor to leave many companies in that industry for dead. But while those companies which had too much debt have gone or will go under, the pessimism in this industry provides some opportunities for value investors. For example, consider The Coast Distribution System (CRV), a wholesaler of RV and boat parts and accessories. Investors rely heavily on the financials that companies release. But managements have significant leeway when it comes to creating its results. 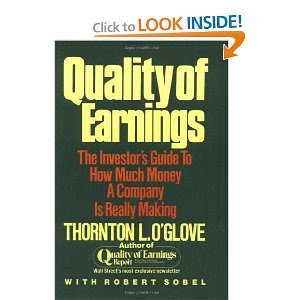 In this book, Thornton O'Glove tells investors how to judge the quality of a company's earnings, in order to both protect against fraud and find value. I now receive a ton of requests for my specific valuations and "buy" prices for particular stocks. Because I have declined to divulge such information, I have received many questions as to why I'm not willing to share such info. As such, I thought it best to share my thoughts on the subject with a post. Gannett owns newspapers (such as USA today) and tv stations, mostly in the US. These industries are much hated by investors today, as revenues are generally in decline; advertising dollars are migrating online as circulation and viewership of traditional media continues to decline. But for value investors, this negativity can create an opportunity. I don't short stocks, but every once in a while I am tempted to do so. For those of you value investors who do short, you may want to consider Green Mountain Coffee Roasters (GMCR) as a potential candidate. In a recent presentation, David Einhorn discusses some of the features that make this a great short candidate: a high price, a lack of free cash flow, some serious accounting questions, frequent capital raises (despite accounting profitability), and some interviews of former employees suggesting a lack of transparency. The slides can be found here. Unfortunately, the stock has already fallen quite a bit since the presentation came out last week. However, the company's P/E of 70 remains at rather elevated levels. Considering its financial position, Aastra Technologies (AAH) is an extremely volatile stock. The stock traded above $40 in 2007, below $8 in 2008, above $36 in 2010, and has now come all the way back down to $13 in 2011. One might expect this kind of stock price volatility for a heavily-levered company with a highly-oscillating profit profile. But Aastra is neither of these; it carries negligible debt along with a ton of cash, and has remained profitable throughout the recession of recent years. As such, these excessive price swings in the shares of Aastra are offering investors an excellent opportunity to buy into a good business at a great price. Value investors love companies with lots of cash. At the very least, a net cash position protects a company from going under when times are tough. And during good times, the cash can be doled out to shareholders. But whether a cash distribution (or buyback) will actually occur is worthy of investigation before the investor actually takes a position, for many companies have no interest in actually returning cash to shareholders. Consider Gaming Partners International (GPIC), a manufacturer and distributor of gaming chips and other casino-related supplies. Investors with huge amounts of assets under management (e.g. pension funds, sovereign wealth funds etc.) are buying US government debt at an astonishing rate. As a result, the annual return one can expect on a US 10-year Treasury is only around 2%! Keeping in mind that the US central bank attempts to keep inflation between 1% and 3%, the level of this fairly long-term issue appears rather unsustainable. Perceptron (PRCP) sells measurement and inspection products that are used by a range of customers from car manufacturers to plumbers. This is a profitable company with a ton of cash (relative to its market cap) and no debt, making it a stock with strong value potential. I have recently received a few questions on the order of "How can I tell if management is shareholder friendly? Can you tell me if management at company X passes the smell test?" The second question is far too difficult for me to answer, for several reasons. First, we all have different standards of just how friendly a manager has to be. Second, "friendliness" can be measured using many different criteria; preferences among investors will vary not only as to which criteria should weigh the most heavily in coming to an overall conclusion, but also as to which criteria should be used at all. Finally, differences of opinion regarding management friendliness will arise between investors even if shown the exact same data; an action one investor may deem friendly may be viewed as unfriendly by another (e.g. a restricted share issue). As such, rather than state my opinion of company X, it is probably more useful for you (and less time-consuming for me) to discuss what information may be relevant in allowing you to answer the second question for yourself, using your own investment criteria, objectives and opinions. A couple of interesting events have taken place at Universal Security Instruments since they were last discussed on this site as a potential "buy" opportunity. The US private sector likely created approximately two million jobs in the month of September. That appears to be in stark contrast to the paltry number the government will appear to report tomorrow. That's because the media outlets omit the word "net" when they report the latest job numbers. While everyone focuses on the "net" jobs figure, the Bureau of Labor and Statistics (BLS) also issues far-less-followed reports detailing total jobs created and destroyed. PetMed Express (PETS) is an online and over-the-phone retailer of pet medications. Its returns on capital have been strong for over a decade. During the recent market turmoil, however, the stock has taken a dive; the stock is now down over 60% in the last year. For various reasons, value investors are encouraged to use an average of several years worth of earnings as an estimate of a company's earnings power. But when a company grows quickly (e.g. through the acquisition of a competitor), average earnings are no longer representative of earnings power. In such cases, other methods of estimating a company's earnings may be more useful. Versant trades for just $33 million, despite no debt and a cash balance of $23 million. With this kind of profile, one would expect to find a company losing a whole lot of money. But this is not the case: Versant has remained profitable every year throughout this downturn! While there is no doubt that free enterprise gives rise to recurrent episodes of speculation, the features that are common to these episodes are rarely analyzed, according to the author of A Short History of Financial Euphoria, John Kenneth Galbraith. This book from 1990 offers perspectives on bubbles that are still useful today. By paying attention to the signs, "there is a chance - a slim chance, to be sure, given the sweeping power of financial euphoria - that otherwise vulnerable individuals will be warned."